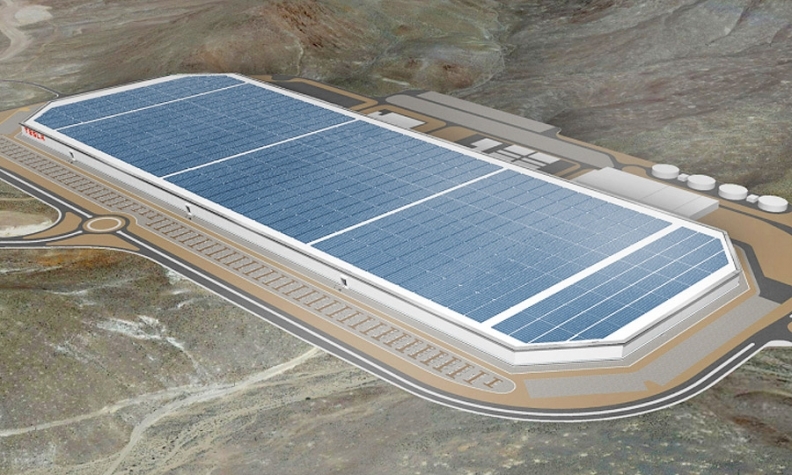 A rendering of the battery plant in Reno released by Tesla last year. The farm-to-table Campo restaurant in the city’s trendy Riverwalk District is offering a 10 percent discount to Tesla employees. This month, the Siena Hotel and Casino is promoting the “Tesla Triple Spin Wheel” and giving away Model S sedans. Tesla employees have begun relocating from the San Francisco Bay Area, buying houses in leafy neighborhoods and enrolling their kids in local schools. The new Whitney Peak Hotel, a non-smoking, non-gambling luxury inn, has become the unofficial headquarters for visiting Tesla workers. JetBlue Airways began offering the first direct flights from New York last month and says the route is already well-subscribed. Tesla Motors Inc.’s $5 billion “gigafactory” may be the best thing to happen to northern Nevada since the silver rush of the 1850s and the gaming boom a century later. The company’s decision to build the facility in an industrial park east of town is giving the self-proclaimed “Biggest Little City in the World” a once-in-a-lifetime opportunity to diversify the economy and transcend Reno’s image as a downmarket Las Vegas. Founded in 1868 as a stop on the transcontinental railroad, Reno is located in a valley 20 miles east of the Sierra Nevada mountains. The city of about 235,000 is struggling to shed an image as a second-tier destination for gamblers and visitors to Lake Tahoe. Reno is clawing its way back from the recession -- embracing the annual Burning Man festival, welcoming the creative class and building a Start-Up Row downtown. The city has lured several large technology companies. Apple Inc. is building a data center. Amazon.com Inc. moved a distribution warehouse from rural Fernley, Nev., to a 1.2- million-square-foot warehouse closer to Reno. Switch, the Las Vegas-based developer of data centers, is building a facility near Reno and helping to fund the University of Nevada at Reno’s new innovation center downtown. The hope is that Tesla’s gigafactory will attract other manufacturers, employers that typically stick around for the long haul unlike technology firms that are more likely to close data or customer-service centers when their business model changes. Exhibit A: International Business Machines Inc., which recently fired half its workers in Dubuque about five years after opening a customer-service center in the Iowa city. John Boyd, who helps companies scout locations for new facilities, says Tesla could transform Reno much the way BMW did Spartanburg, S.C., when the automaker opened a plant there in the 1990s. Boyd says suppliers will flock to be close to Tesla as they have in Fremont, Calif., where the company builds its electric cars. Panasonic Corp., a supplier and major investor in the gigafactory, plans to send hundreds of workers from Japan. “We couldn’t be more excited about Tesla’s future in Reno,” says Khobi Brooklyn, a company spokeswoman. There’s one area of concern: Local colleges don’t graduate enough students with the technical skills to fill the gigafactory’s expected 6,500 permanent positions. Tesla is investing $37.5 million in Nevada’s K-12 education system and the state is pursuing reforms. But there’s very little for higher education apart from the company’s $1 million for battery research at the University of Nevada in Las Vegas. A 2014 Brookings report urged the state to boost the number of Nevadans who possess at least some post-secondary training in “STEM” -- science, technology, engineering and math. This fall the engineering school at University of Nevada at Reno will start offering a minor in Batteries and Energy Storage Technologies. JB Straubel, Tesla’s chief technology officer, will speak at the UNR College of Engineering in October. University President Marc Johnson dismisses skeptics who say Tesla will struggle to find enough skilled workers. “Reno will be ready,” he says. Tim Den Hartog, 47, is among more than 400 people on a waiting list to take a production technician class at Reno’s Truckee Meadows Community College. He’s relocating from Sioux Falls, S.D., with his wife and two kids. When Tesla announced plans to build a battery factory last year, Reno wasn’t even on the radar. The smart money was on San Antonio. Desperate not to be shut out, Reno area officials called Tesla and arranged for a private jet to fly them in for a tour. Tesla officials declined to take the plane trip but made plans to visit Reno shortly afterward. The city had several advantages. A four-hour drive from Tesla’s factory, Reno is accessible by rail or Interstate 80. There was ample land at TRIC, the Tahoe Reno Industrial Center, east of town. FedEx, Wal-Mart and Diapers.com already had operations there. Nevada levies no corporate or income tax. When Tesla’s team visited TRIC, their hosts were ready with an earth-moving permit, which in many jurisdictions can take weeks to acquire. Tesla could start digging that day. When completed, Tesla’s factory will be about the size of 174 football fields. Located on Electric Avenue about 23 miles east of Reno, the construction site is locked down tight. From the scrubby surrounding hills, the two-story facility resembles a top-secret government installation. The giant construction project will create 9,000 jobs, according to an economic impact report from Nevada’s Office of Economic Development. That’s welcome news for the building industry, says Todd Koch, president of the Building & Construction Trades Council of Northern Nevada. He says jobs are critical for a union that lost two-thirds of its members and endured at least three suicides after the financial crisis. Since the Tesla deal was announced, commercial, residential and rental real estate values have surged. The May 2015 median home price was $284,900, up 19 percent from $240,000 in May 2014, according to the Reno/Sparks Association of Realtors. Developers are snatching up parcels at TRIC. In the next 20 years, Tesla is expected to generate about $97 billion in economic activity in and around Reno and boost regional GDP by an estimated 26 percent, according to the economic impact report. Besides the 6,500 factory positions, Tesla is expected to create 16,200 more indirect jobs. City officials are hopeful that the factory will deliver on those lofty ambitions. Meantime, locals are looking forward to even a modest uptick in economic activity. Ryan Mayol, a shift manager at the Little Nugget casino on Virginia Street, Reno’s main drag, is already anticipating the so-called multiplier effect. He said: "All those workers have to have a place to live and spend their money."